April 10, 2014 /1 Comment/in Christmas Ornaments, Easter Craft Ideas, Foam Crafts, Party Ideas /by Craft Supplies for Less, Inc. These adorable Minions are perfect for Christmas Ornaments, Easter (as Minion Eggs), or your next Minion Party! Can be made into necklaces that kids can wear or hang these as party decorations. 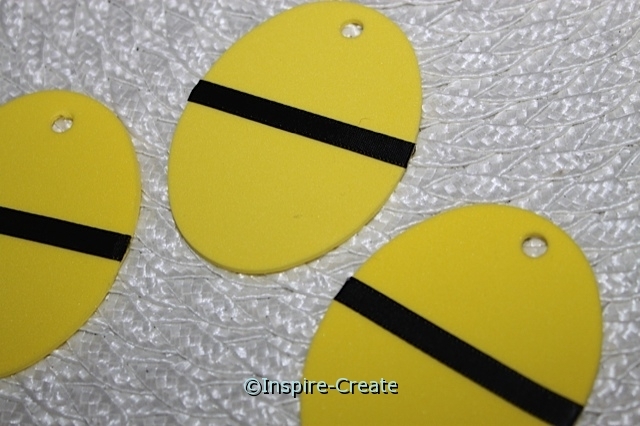 All it takes is Yellow Oval Shapes (made from craft foam), Large Wiggle Eyes, Black Ribbon, Glue Dots & Lines, and a Black Sharpie Marker. There is no drying time necessary making this is the perfect make and take craft for your next holiday party or craft day! 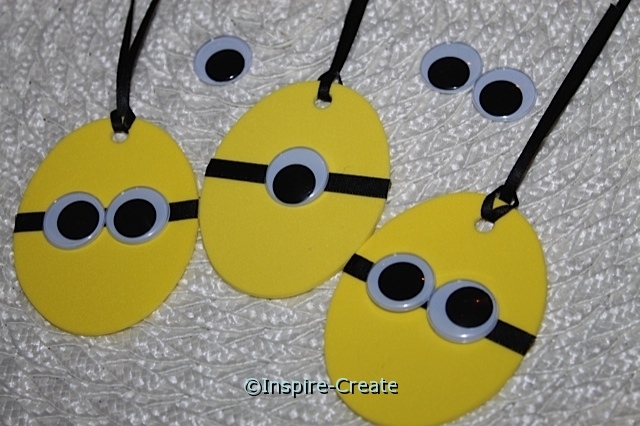 Making these Minion decorations/necklaces takes only minutes. Let’s get started! 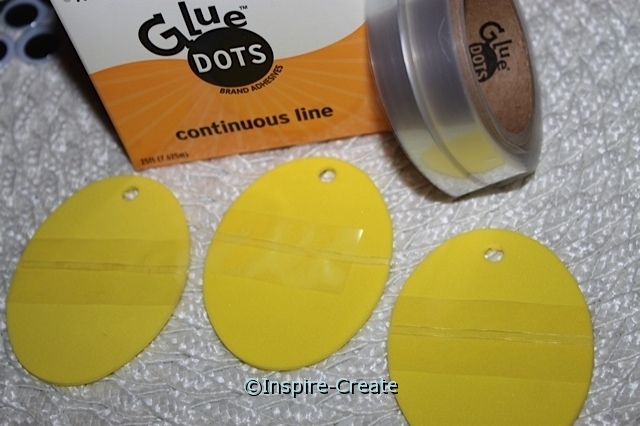 Using a 1/8″ Single Hole Punch, punch holes at the top of each yellow oval shape. Next, attach “Continuous” Glue Lines across the Small Yellow Oval Foam Shape (just above the center). The Glue Line will hold the ribbon in place without any messy glue or drying time. Simply cut the Glue Line at the edge of the yellow oval. Peel the clear plastic cover off to expose the Glue Line (double-sided glue). Now its time to attach a 2 3/4″ piece of 1/4″ Black Satin Ribbon to the Glue Line which makes the “goggle strap”. 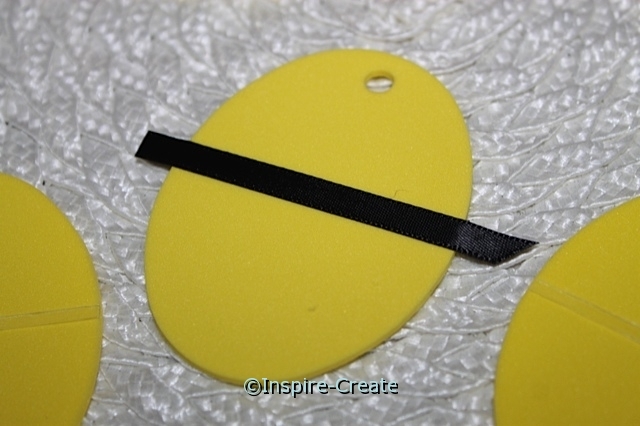 Then, trim the ribbon close to each edge of the yellow oval. Suggestion: if making for a party or group event we recommend cutting 2 3/4″ strips of black ribbon ahead of time. Now for the Wiggle Eyes! 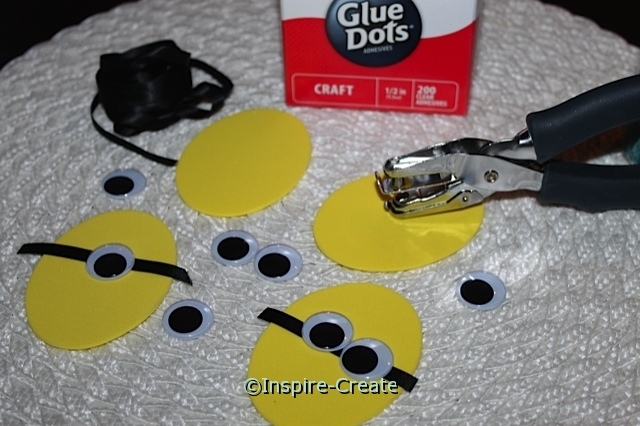 Our large 20mm Wiggle Eyes are not sticky back, therefore, we recommend using a 1/2″ Craft Glue Dot to simply peel and stick the wiggle eyes to the ribbon & foam. Attach either 1 or 2 eyes to the Ribbon “goggle strap”. 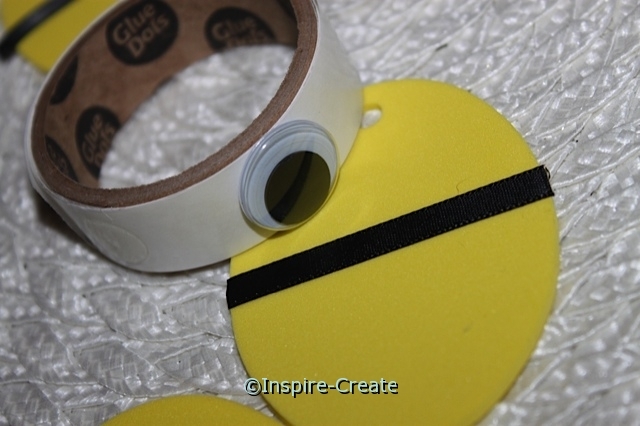 Once the wiggle eyes are attached, add the ribbon to make it into a necklace or for hanging. 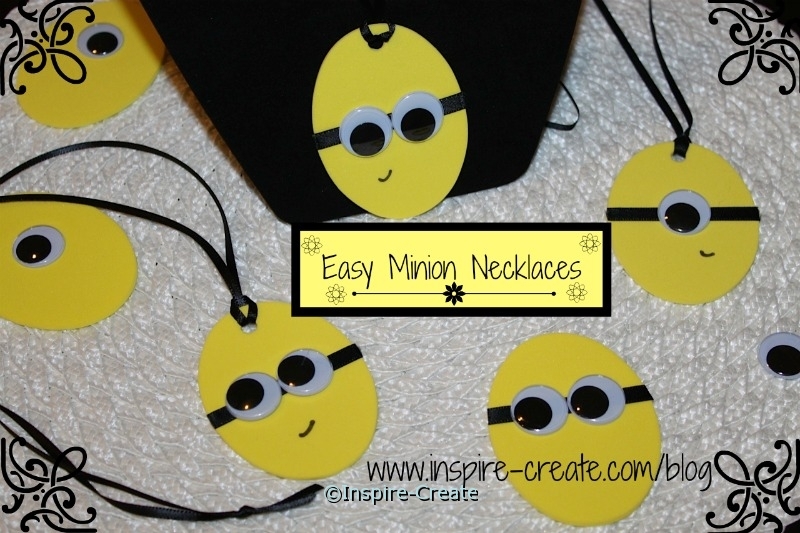 For a Minion Necklace, cut a 30″ piece of ribbon. To hang on a tree branch or use as a Minion party decoration, cut a 12″ piece of 1/8″ Black Satin Ribbon. Fold ribbon in half and feed the loop through hole at the top of the yellow oval. Then, feed the 2 ribbon ends back through the loop to secure to the oval shape. Tie ends and these are almost ready to hang… just missing a little Minion smile. Lastly, draw small smiley faces on the yellow oval shapes. Black Fine Point Sharpie Markers work well. Be careful not to touch the ink until it dries (just a few seconds). 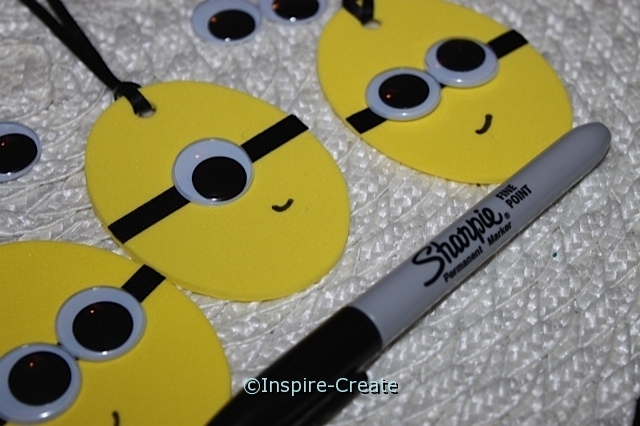 These Minion Necklaces make a great craft and party favor. Kids will enjoy making and wearing these. Best of all they cost less than .50 cents each to make! We would love to hear from you! Tell us what you think. Post a comment below! Have the kids post their names next to markers sayiing how many words per MINION they can type!